DC Environmental will provide consolidated invoicing, regulatory compliance assistance and more so you can keep your focus where it belongs – on your building, staff and tenants. LEED-certified account managers analyze waste stream volume on-site while taking note of all recyclables that could be diverted. An inspection report is provided to property management. Helps property management recycle or dispose of universal waste (bulbs, batteries, propellants, etc.) in accordance with state and federal regulations. 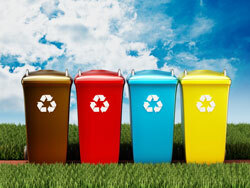 Helps property management recycle or dispose of hazardous waste (oil, paints, solvents, fuel, etc.) in accordance with state and federal regulations. Waste in overflowing bins will be reallocated to less full bins on property allowing more space, eliminating overflow issues, and reducing waste collection visits. Targets and removes bulky items in and around enclosures that cannot fit inside standard sized dumpsters. All smaller bulky items will be crushed or dismantled to fit inside dumpster.